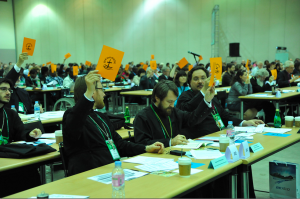 October 30, 2013 – the 10th General Assembly of the World Council of Churches began its work at the Bexco convention center in Busan. The delegation of the Russian Orthodox Church is led by Metropolitan Hilarion of Volokolamsk, head of the Department for External Church Relations. Among the speakers at the opening were Dr. O. Tveit, WCC secretary general, Dr. Walter Altmann, president of the Evangelical Lutheran Church in Brazil and moderator of the WCC Central Committee, Dr. K. S. Wan, moderator of the Assembly Preparatory Committee, and Busan Mayor Hur Nam-sik. The Assembly is expected to discuss Christian solidarity and mutual aid in face of the persecution against Christians in various parts of the world, a peace settlement in Syria and economic and social justice in the modern society. The opening ceremony concluded with a dramatized presentation, after which the 10th Assembly of the World Council of Churches held its first plenary session.